Oh my baby is almost at his half Birthday! He’s coming on leaps and bounds and I think he must have hit a developmental milestone this month, as just looking back on his Four Month Update the difference in a month is huge. Weight – 17lbs exactly he is now just above 50% line in the red book. Monkey was the same dropping from the 90th percentile to around 50th and then tracking so I was expecting Kipper to do the same. 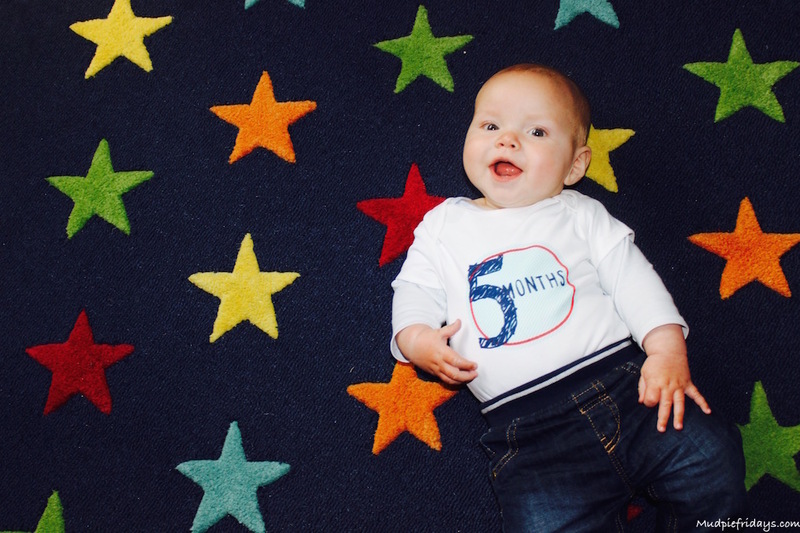 Clothing Size – as I write this he is laying next to me dozing and is wearing a t-shirt which is 6-9 months. A number of his 3-6 months bits are getting too small, mainly the all-in-ones. Separates seem to be doing better and anything without feet work well, although that means I then have to deal with socks (sigh). For some reason I think Monkey must have fitted into 3-6 months for longer as we have a bit of a glut of clothes for this age group. But not much in the 6-9 month mark. I have discovered things such as the pram suit which I was hoping to reuse will not last through the Winter, but then its nice to buy the new odd bit. I’ve finally manned up and divided the smaller clothes into throw, keep and gift. I probably kept more than Hubby would like but since he doesn’t read my blog he has no idea! The other bits are going to my step sister who is due with her first little boy in December. As for not having another… well theres probably a post coming on that at some-point (sob). Teeth – no update, he’s starting to suffer though, but still with a smile bless him. Everything goes in his mouth and he likes nothing more than a knuckle to chew on! Loves – playtime we have been visiting the local sensory room and he is fascinated by light movement. Kipper loves rolling over and holding himself up to see whats going on, he’s never still. He’s enjoying Nursery rhymes more and more one of his firm favourites is The Grand Old Duke of York with actions! Kipper loves to interact and talk, gurgle and answer your words with his. He’s still fond of mummy time and would much prefer to come into our bed in the early hours. Hates – being hungry and teething which sometimes wakes him in pain. He’s such a happy baby we are truly blessed with him. He wasn’t too keen on the door bouncer which he went in for the first time the other day, but I am hoping as he gets bigger he will change his mind! Habits – everything goes into the mouth partly because of teeth and partly because he is looking to explore. He will no longer stay on his back rolling all over the place and then getting grumpy as he hasn’t figured out how to roll back again. He’s found his thumb! But thankfully the dummy is still his pacifier of choice which I am hoping to continue with. Muslins are still used to play peekaboo with and he has started to make a very specific sound when he wants food, its hard to explain but it almost sounds like ‘hungry’ to me! Milestones & Firsts – we are not weaning yet wanting to wait until the six month mark, yet he did steal a bit of cucumber off of my plate the other day! Kipper often watches us as we eat with great interest. Still in his moses basket in our bedroom he will be moving into his own room and cot in the next couple of weeks, as he has almost out grown his basket. He’s had his first swimming lesson and I am planning an under water photo shoot with him and Monkey during the half term holidays. 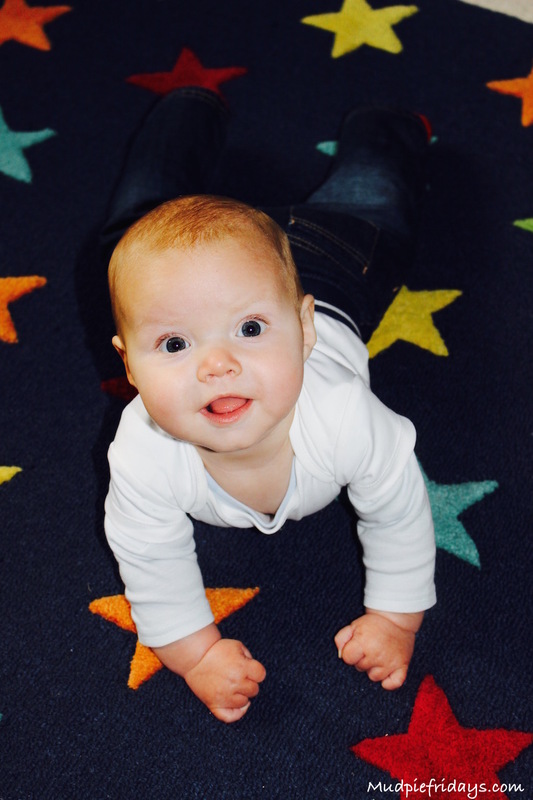 Kipper has also enjoyed his first baby sensory class and is growing very fond of our sensory room outings. Development – he’s rolling around all over the place and tonight as I write this he found his feet, taking great delight is sucking on the feet of his babygrow. He has started to raise his bottom and attempt to crawl but thankfully at the moment is no where near close. Kipper can sit up straight against me and is starting to show signs of sitting unaided although this is a little way off. He’s tried out Monkey’s highchair for size as well. He likes to put his hands in my mouth and my hands in his mouth, he’s also partial to the odd sucking of the nose. Kipper has also started to study items closely including toys and his hands. Not only is does he know his name but he will often respond with a gurgle when we speak it. His personality is starting to shine through and although he appears to be placid I get the impression that he will have a feisty streak. Eating – to think on the next update we will have likely started weaning! Its coming round so quickly. He is still predominately breastfed although I have been guilty of the odd bottle to see if we can get him to go through the night, with no success I hasten to add! Sleeping – during the day he is now in definite morning and afternoon naps but sleeping at night is all over the place and he often wakes in the early hours. For some reason nearly always around 3am, although he has woken at 2am and 4am! Its a little bit a shock since Monkey was such a good sleeper, but I think it could be partly because he loves to come into our bed. I do love our snuggles (an realise they will be over before I know it) but I am keen to break the habit once he moves into his own room. Sigh. Toys – mainly anything he can chew. Lamaze toys continue to be a big hit. I have written about our play habits in 10 play ideas for your 4 month old and I have also been making our own sensory toys at home, Black & White Sensory Toys & Box. He’s also enjoying a starry nightlight which we received from Wicked Uncle. Not to mention our trips to the local sensory rooms. Favourite Outfit – too many again! 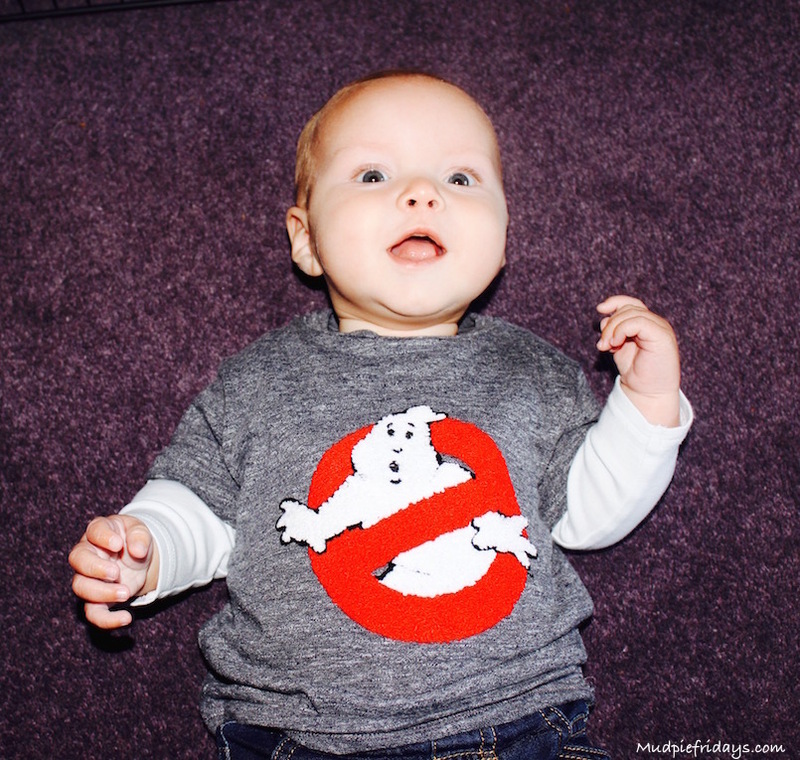 Although I am rather partial to his ghostbusters t-shirt from Next. I’ve also got some lovely new outfits from Jojos which are adorable, more on these to come soon. Things I don’t want to forget – the way he looks at me sometimes, when he’s in my arms and we are having a quiet moment. I keep trying to catch it on film but it distracts him and I loose the picture. Its true unconditional love. The way that Monkey holds his hand in the car. The smiles, oh the smiles especially in the morning when he wakes up. Looking forward to … starting our weaning journey and not going back to work as planned in November. Instead I have three more months to spend with this lovely little man. Ahhhh he’s so cute!! I loved weaning with my little girl. It’s so exciting isn’t it. Oh so Sweet! My two didn’t get their first teeth until they were nearly 9 months old. He is soooo darling! Truly beautiful AND he looks so good-natured. You really have your hands full — how DO you find time to blog?! Hi Clare, what a lovely post to be able to look back and read one day. Teething isn’t nice and I hope it’s not too difficult a time for you. Kipper is certainly going into that cute stage when they are still immobile, but taking it all in. And keep enjoying those cuddles!